Valentine’s Day is less than two weeks away—and if you're still looking for last-minute plans, we’ve got you covered. Plenty of restaurants (and even a meal kit service) are offering deals for the holiday, including free chocolate, dinner specials for two and, of course, all sorts of heart-shaped treats. (There's especially good news if you're planning on ordering pizza). Check out all the deals we’ve found so far below, and keep checking back as we add more in the days leading up to February 14. Heart-shaped cinnamon and sugar pretzels are available buy-one-get-one-free on Valentine’s Day—you can claim the offer on Auntie Anne’s site February 11, according to People. This Valentine’s Day, CPK is capitalizing on America’s love for pizza in several ways. (Is there anything more romantic than bread and melted cheese? We’ll wait). For starters, you’ll be able to order heart-shaped thin crust pizza from February 13 to February 17, both in-store and online at participating locations. You can also score a “Sweet Deal for Two” if you haven’t made dinner reservations yet—the offer includes a choice of appetizer, two entrées, and dessert for $35 (if you want wine, it’s an extra $12). Head to Carrabba's from Valentine's Day through Sunday, February 17 to get a four-course meal for two starting at $45. Starters include calamari and "Mozzarella Marinara;" for the main, options range from Tuscan-Grilled chicken to spaghetti and meatballs. Order from Chuck E. Cheese's via DoorDash on Valentine's Day to get free delivery and a goody bag. The offer only applies to participating locations, and you need to order food in order to get the deal (one goody bag per order). 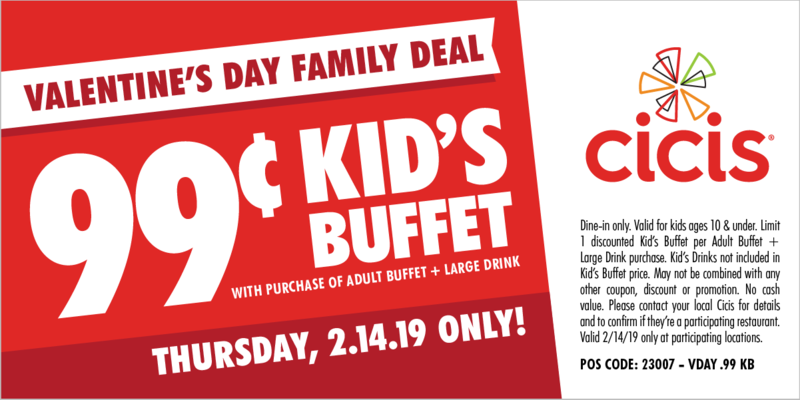 For Valentine's Day only, if you buy one Adult Buffet meal and a large drink, you'll get a Kid's Buffet meal for 99 cents (drink not included). Grab the coupon here. According to the brand's Instagram, you can get a free drink with any "regular or larger-sized beverage purchase" on February 14. Dunkin’ is bringing back their heart-shaped donuts for Valentine’s Day, and also introducing a new cookie dough and brownie batter-filled donut (yes, please)—plus, 10-count boxes of Munchkins will be available for $2 “for a limited time this month” at participating locations nationwide. Find out more on their site. 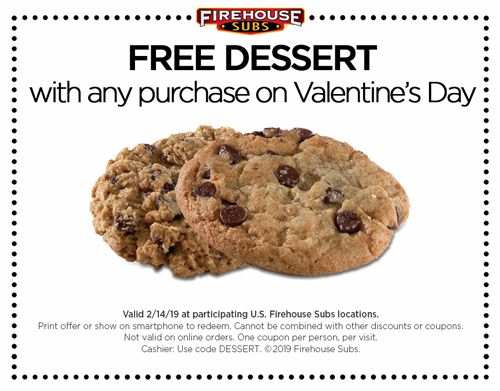 Head to Firehouse Subs on Valentine’s Day to get a free dessert with any purchase—all you need to do is show a coupon, which you can find here. According to Twitter, customers who eat at Fogo de Chão on Valentine's Day-through February 17 will receive a dining card good for one "full Churrasco lunch, dinner, or Sunday brunch with equal purchase on your next visit." The Fresh Market is offering a "Valentine's Day Dinner for Two" for $59.99, which includes two entrées, two sides, dessert, and one dozen roses. See the detailed menu and order online, or order in store. Godiva has two chocolate promotions for Valentine’s Day—free pieces of Caramel Embrace (February 1 through February 9) and Dark Chocolate Hearts (February 10 through February 16) at stores nationwide. To celebrate Valentine's Day (and the launch of its new mini ice cream pops), Halo Top will offer 1,000 customers one free box of Halo Top Pops on February 14, redeemable online starting at 12 p.m. EST (enter code "HaloTopPops"). New Yorkers can also head over to Grand Central Terminal on V-Day, where 30,000 free samples will be offered at a pop-up in Vanderbilt Hall. For both promotions, you'll have to identify if you're single, taken, "it's complicated," or "just hungry" in order to score the free pop. Find out more here. #ShredYourEx is back at Hooters. Simply bring a photo of your ex to shred (or shred virtually) and you'll get a coupon for buy ten, get ten free boneless wings. In more heart-shaped pizza news, Hungry Howie’s will offer a heart-shaped pizza with one topping for $6.99 (the code is “HEART1”); or, add on a heart-shaped cheese bread as well for $12.99 (code is “HEART2”). The promotion runs from February 11 through February 14. If you order Jack in the Box via the app, you can score free dessert on Valentine’s Day—either a five-piece churro, cheesecake, or regular shake. Enter the code “HEART” on the site to get 20 percent off Valentine’s Day cookie cakes. The offer is live from now through February 7; both round and heart-shaped options are available. Breadstick devotees, rejoice—Olive Garden will offer a dinner deal for two on Valentine’s Day. The meal includes one shareable entrée for two (Five Cheese Ziti al Forno, or Chicken Alfredo for an extra $6), a shareable dessert (Black Tie Mousse cake or tiramisu), breadsticks, dipping sauce, plus a soup or salad. The meal starts at $35.99 and is available through February 14. In the market for a meal kit service? If you sign up for Plated on or before V-Day, you’ll get one year of dessert free (that definitely beats a box of chocolates). All you have to do is enter the code “BEMINE”—order here. Craving fried chicken? You're in luck—Popeyes will offer a Valentine's special called "2 Can Dine" on February 14. The deal includes five pieces of chicken (tenders, or mixed), two sides, and two biscuits for $10. If you’re celebrating Valentine’s Day solo, Potbelly has you covered—singles can get a free cookie on February 14. Think of this deal as a candygram, but healthier. You can send someone a free juice (or Kiehl's product) by filling out this form on Pressed Juicery's site. Qdoba for a kiss is back, according to its site. In other words? When you buy one Qdoba entrée, you get one free if you share a kiss with someone else. Even if you hate PDA, you can still get the deal—kissing a picture also counts, as the site says "all kisses are accepted." As a Valentine's Day special, Macaroni Grill offers a $45 prix fixe menu for two—the deal includes one appetizer, two entrées, and one dessert. According to the site, order anything on Valentine's Day to receive a free mini bottle of Schlotzsky's Louisiana-style hot sauce.